Miami, FL, April 2, 2012/-- Accentmarketing, a full-service multicultural marketing communications agency, was named one of the Top 50 Women-Led Companies of Florida by The Commonwealth Institute South Florida (TCI) and the Johnson A. Edosomwan Leadership Institute at the University of Miami School of Business Administration. 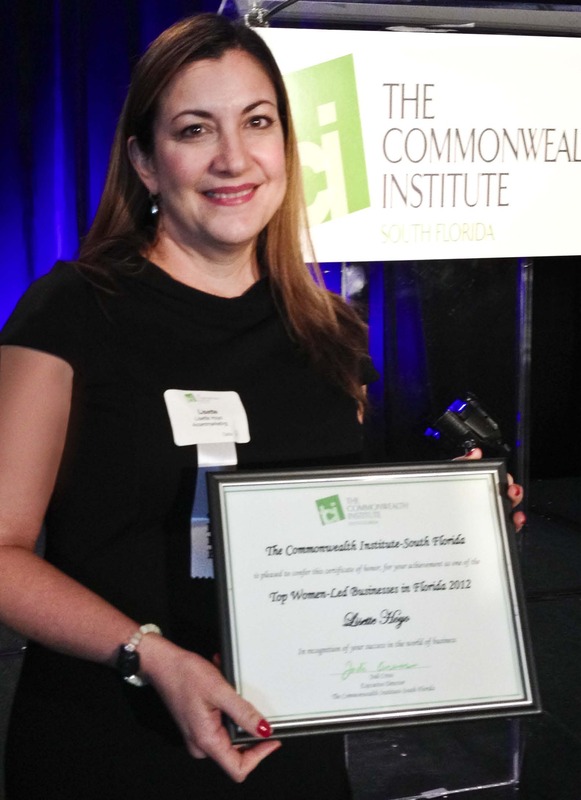 Accentmarketing�s President & Managing Partner, Lisette Hoyo, was recognized during the prestigious ceremony that honors the women who lead these companies. Ms. Hoyo has over 24 years of advertising and marketing experience helping clients succeed in both the U.S. general and Hispanic markets. In her past 12 years at Accentmarketing, Lisette successfully led the agency's largest client teams as Director of Client Services and of the Strategic Communications Group. She was named president of the agency on December of 2009. She currently serves on the 4A's (American Association of Advertising Agencies) Florida Council Board of Governors as Vice Chair, is a member of the 4A's New Business Committee, and of The Interpublic Group of Companies' MERGE (Multicultural Employee Resource Group for Excellence) Executive Committee. �On behalf of Accentmarketing and my business partners Diana Ocasio Fant and Alice Rivera, I am honored to receive this recognition that acknowledges the perseverance, hard work and contributions women leaders are making both in the business community and in our economy. It is humbling to be in the company of such dynamic women leaders,� said Lisette Hoyo. The Commonwealth Institute South Florida (TCI) and the Johnson A. Edosomwan Leadership Institute at the University of Miami School of Business Administration will publish the list of 50 honorees later this month on www.commonwealthinstitute.org, accompanied by profiles of some of the respondents, as well as a survey of the business challenges women leaders are facing. Established in 1994, Accentmarketing is a full-service multicultural marketing communications agency with offices in Miami and Los Angeles. A certified minority-owned business and member of The Interpublic Group of Companies, Accentmarketing employs a multinational and multicultural staff. The agency's client partners includeKaiser Permanente, Dunkin� Donuts, Farmers Insurance, Gobierno USA.gov, General Motors, Coventry Health Care, CasaIdeas, The Humane Society of Greater Miami, and the U.S. Navy. For more information, go to: www.accentmarketing.com. Launched in 1999, DiversityBusiness is the largest organization of privately owned businesses throughout the United States that provide goods and services to Fortune 1000 companies, government agencies, and colleges and universities. DiversityBusiness provides research and data collection services for diversity including the "Top 50 Organizations for Multicultural Business Opportunities", "Top 500 Diversity Owned Companies in America", and others. Its research has been recognized and published by Forbes Magazine, Business Week and thousands of other print and internet publications. The site has gained national recognition and has won numerous awards for its content and design. DiversityBusiness reaches more diverse suppliers and communicates more information to them on a more frequent basis then all other organizations combined. We also communicate with mainstream businesses, government agencies and educational institutions with information related to diversity. Our magazine reaches over 300,000 readers, a monthly e-newsletter that reaches 2.4 million, and website visitors of 1.2 million a month. It is a leading provider of Supplier Diversity management tools and has the most widely distributed Diversity magazine in the United States. DiversityBusiness.com is produced by Computer Consulting Associates International Inc. (CCAii.com) of Southport, CT. Founded in 1980.